Creamy (no churn!) vanilla ice cream loaded with 2 different kinds of cookies. A cookie lover’s dream come true! I don’t want to sound like an old fogey, but Sesame Street these days is just ridiculous. Apparently Cookie Monster eats vegetables and says that cookies are a “sometimes” food?!?! WHAT?! Pfffttt. If you’re like me and believe cookies are one of the main food groups, then this ice cream is for you! It’s loaded with 2 different kinds of cookies and I mean loaded! No 1-2 cookie pieces per bowl on this blog uh-uh! One thing to note here is the use of store bought chocolate chip cookies. I adore store bought sweets as much as the next guy (okay probably even more, looking at you store bought cupcakes!). However, packaged chocolate chip cookies are not my favorite. However, they work really well here because their crunchy texture stands up to the ice cream.You may be able to substitute a very crunchy homemade one instead. If you’re looking for a recipe I’m afraid I can’t help you because I’m a soft and chewy girl through and through! Whip heavy cream, vanilla, and food coloring together until stiff peaks form. If you're like me and don't have a mixer all you need is a VERY cold bowl/whisk and some upper arm strength! Stir in sweetened condensed milk until well blended. Add additional food coloring to reach your desired shade of blue. Fold in chopped cookies sprinkling extra on top if desired. 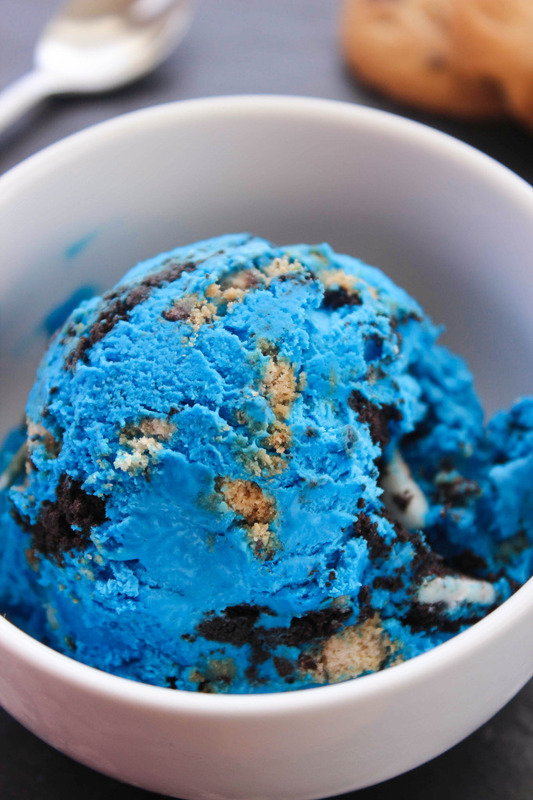 0 Response to "HOMEMADE COOKIE MONSTER ICE CREAM"